1.Find some card board you can use for the covers of the accordion file. I used an old cardboard mailer box that I had in my stash of old packaging (yes, I have a stash of packing!). 2. Cut two identical pieces to 6 1/4" x 9". 3. Use patterned paper to cover the two piece of cardstock (I used Fun Stampers Journey "Black and White" pattern paper set), making sure that the inside edges are covered about an inch and a half in as shown in the picture below, then set aside. 4. 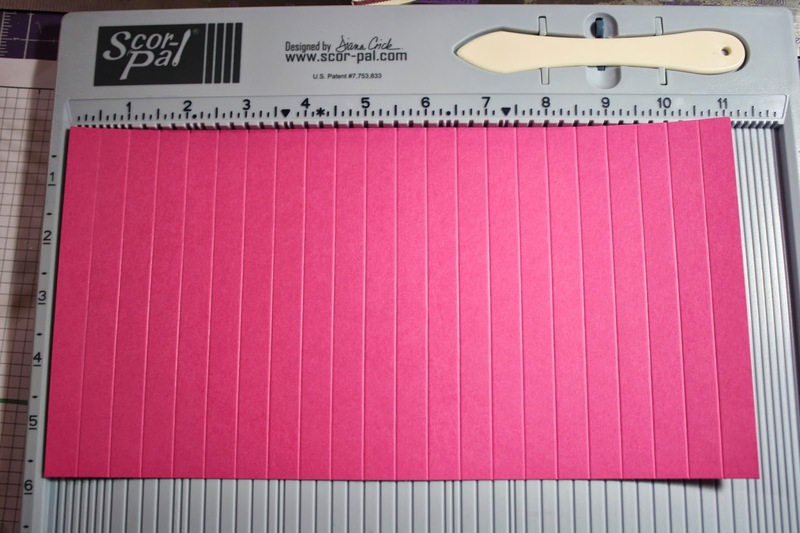 Cut two pieces of card stock to 5 3/4" x 11", then using your Scor-Pal score at the 1/2" mark, lengthwise, all the way across. 5. Fold back and forth at each score line, to create the accordion part of the file. 6. Cut a piece of card stock to 5 3/4" x 8 1/2", then score at 1 3/4" and 4". 7. Fold on the score lines and add adhesive to the side flaps. 8. Adhere center strip as shown below. 9. Cut eight, 8" x 5 1/2" pieces of card stock to be the separators for the accordion. 10. Adhere the two accordion pieces to one of the 8" x 5 1/2" separator pieces using Scor-Tape. 11. Skipping every other fold, adhere the remaining 8" x 5 1/2" separator pieces using Scor-Tape. 12. Adhere to outer cover using liquid adhesive. Once one side is glued down, press accordion file down and adhere the second side by "closing" the cover of the file over it and pressing firmly. 13. You file is complete! 14. To embellish my file, I added some velcro and created a cute flower clasp. I used Fun Stampers Journey "Summer Garden" stamp set for the flower part. I simply stamped and cut it out three times on card stock, then glued all the layers together to make it sturdy. I then colored it with my Copic markers and added a couple of layers of Journey Glaze to harden it up. Voila! Thanks so much for stopping by and checking this tutorial out! Have a wonderful day and I can't wait to see what organizational projects you are inspired to create! What a fabulous file Janice. The colours are stunning too! What a yummy accordion file! The colors are delish and love the little closure. awesome project! thank you for sharing. This will be on my blog inspiration post.